Bees are an important part of our ecosystem, and invaluable for farmers. They can, however, pose safety threats, especially for people who work outdoors with farm equipment. On July 7th, a Fort Davis man was killed by bees while operating a bulldozer near Marathon. Katherine Ottmers and her husband run a small ranch outside of Alpine and are also affiliated with the College of the Melissae, the center for sacred Beekeeping in Ashland, Oregon. Ottmers says this season’s rains and wildflowers are helping bee colonies thrive. That’s good news, but this can come with increased swarming, and some bees are demonstrating what are called Africanized tendencies. You can’t tell by looking at the bees whether they’re Africanized or have Africanized traits, of whether they’re European honeybees. But some of the differences are that a European honeybee will have a smaller amount of guard bees. Guard bees are the bees that would come out and protect the colony when it’s being opened up, say a bear or something was trying to get the honey. They would come out and sting the bear. But Africanized colonies have a hundred times more of these guard bees. We would want to have a t-shirt and a long sleeve shirt on, a pair of blue jeans, boots, a bandana around our neck, a hat— these are the same things that serve us for sun protection. The other thing is that we would want to have a fire extinguisher and/or a soapy water bug sprayer. Like Dawn dish detergent water in the bug sprayer. And that’s helpful for both wildfires and for bees. Africanized bees do tend to be closer to the ground or in the ground. They can be found in water meters and abandoned bee hives. The vibrations of a tractor can set off these bees, so Ottmers recommends checking an area before heavy equipment is to be used. If you do find a hive, there are steps to be taken. Once you know that there’s a hive in the area, you want to alert other people that that hive is there so that nobody accidentally comes upon it or creates some kind of disturbance to create that defensive reaction from the bees. 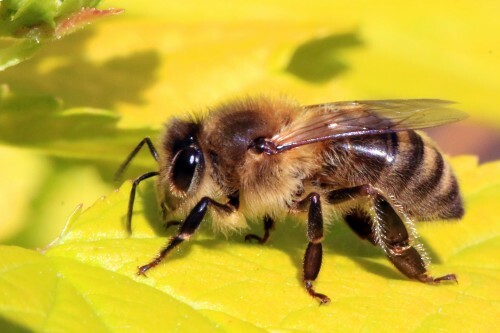 If you try to use pesticide or insecticide on a hive of bees, it will just aggravate them. It doesn’t get rid of them. In West Texas, many animal control departments have lists of beekeepers that can help with hive removal. For Marfa Public Radio, Katherine Rae Mondo. This entry was posted in KRTS News and tagged africanized bees, honeybees, Safety. Bookmark the permalink.